Throughout the wood flooring industry, the Janka Hardness Chart is recognized as the main source for questions related to the density and relative hardness of both domestic species as well as exotic wood species from around the world. Janka Hardness ratings are determined by testing how much force it takes to embed half of a .444 inch steel ball’s diameter into a piece of wood from a particular wood species. The indentation that is left is how the wood’s hardness is measured. While the chart is not considered an absolute foolproof way to determine hardness (as environmental factors must also be taken into account), it is widely considered the most accurate method used to compare one wood species to another. Understanding how the Janka Hardness scale works is simple! In short, a higher number (rating) on the Janka scale equates to a harder wood species; the lower the number, the softer. A Janka rating provides a great barometer for determining how well a particular floor may withstand denting and wear. 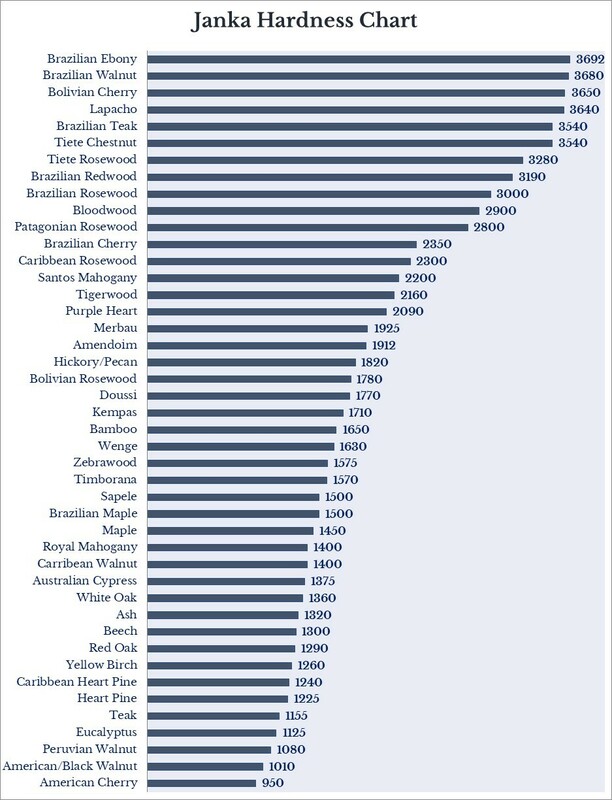 As the corresponding chart suggests, some of the hardest wood floors on the market are exotics – Brazilian Walnut (Cumaru), Brazilian Teak (Ipe), and Lapacho to name a few. Domestically, Hickory is the hardest hardwood floor we carry. This does not mean other species are inferior or will not perform well but just simply not as hard as other. Of note, the industry standard for determining whether or not a particular wood species is an appropriate option for flooring is Red Oak. Keep in mind, to get the most out of your hardwood floor’s natural potential for durability and performance, proper installation is critical. Please refer to the NWFA’s website for a list of approved hardwood flooring installers in your area.